I’m on a train, a train heading in the wrong direction. It’s heading in the wrong direction because it’s taking me to work. I got on at Swindon with the same faces I see every day – plus a few new ones (who, as all commuters know, have no right to be there – at least not in ‘your’ seat) – and now I’m trying to write to you. I’m doing it the old-fashioned way, and my pen is bouncing all over the page as the wheels bounce over points and joints and goodness knows what. My fellow travellers tuck in to muffins and pastries, sip their lattes, read their papers and prod their phones. It’s February, and it’s quieter this morning as many are joining their children on their half-term holidays. Their absences mean the cloud of yoghurt-breath, BO and flatulence is smaller than on some days, the chances of being trampled or tripped up just a little bit less. These peccadillos matter far more than they should, but it is alas the way of things when using trains to facilitate the daily grind. As my train powers on to Paddington, I start to think about my return this evening, but muse more on the prospect of heading the ‘right way’ in the mornings too. Not to Bath or Bristol, but a little bit further to Weston-Super-Mare – a seaside town, and well known and loved by me since childhood. During that wonderful Whitsun week, there would be endless ice creams on the Grand Pier, endless sandcastles, countless visits to the old Model Railway. There would often be a train ride too – a day trip to Bristol behind a chugging diesel (a Class 33, for those – like me – who like to know such things). How wonderful it all was! But how wonderful too it must have been to have gone to Weston in the days of steam, waiting on the platform with raincoats over suitcases, buckets, spades and all the paraphernalia of the traditional British holiday. It’s a tradition that goes back a long way: when Swindon had a railway works, Weston – along with Tenby, Torquay, St Ives, Weymouth – was a favourite choice during ‘trip week’, during which thousands would down tools and leave the town virtually empty as trains took them away from it all for a short precious while. 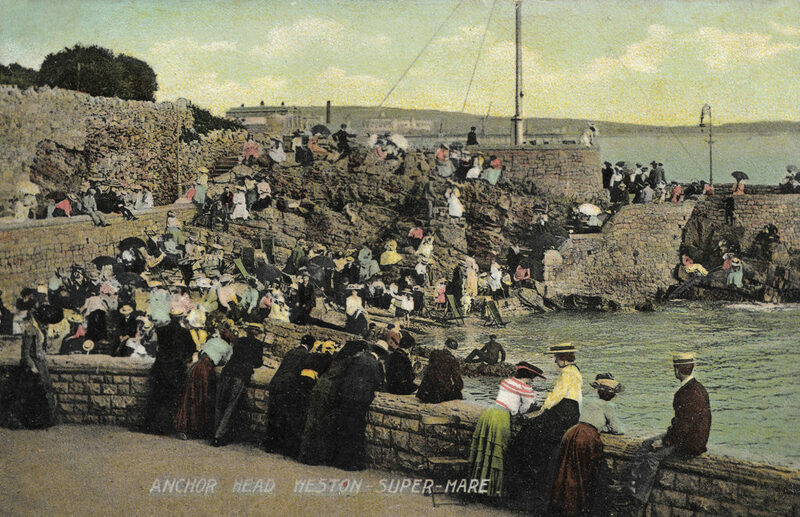 Weston’s origins can be traced back to the Neolithic period, but it was the fashion for sea bathing – sampled by George III at Weymouth in 1789 – that set it on a course away from farming and fishing. Many of the first visitors came by coach from Bath and Bristol in numbers soon sufficient to warrant a hotel, Weston’s first opening in 1810. As with Brighton, at first there were objections, local landowners being somewhat wary of this still-new technology; so much so, that when Parliament granted the Bristol & Exeter Railway powers to build a line between those two cities on 19 May 1836, Brunel – the company’s engineer – was obliged to bypass the town some 1½ miles to the south. As work progressed on this important broad gauge route, however, there was a change of heart (although fears about ‘noisy’, ‘smelly’ steam engines were such that when the first train arrived in the town on 14 June 1841, it was hauled by a team of horses). Brunel’s original station was a small affair in Regent Street, but when the branch was doubled in 1866, a new facility was opened on the other side of the road – conveniently doing away with a decidedly inconvenient level crossing. Though modified for mixed-gauge working in 1875, it was also in this year that powers were acquired to lay a four-mile standard-gauge loop into the town, allowing a Weston stop to be added to certain through services. By the time it opened on 1 March 1884, branches had been built to serve 14 more seaside resorts, including Blackpool (1846), Southport (1848), Eastbourne (1849) and Torquay (1859). 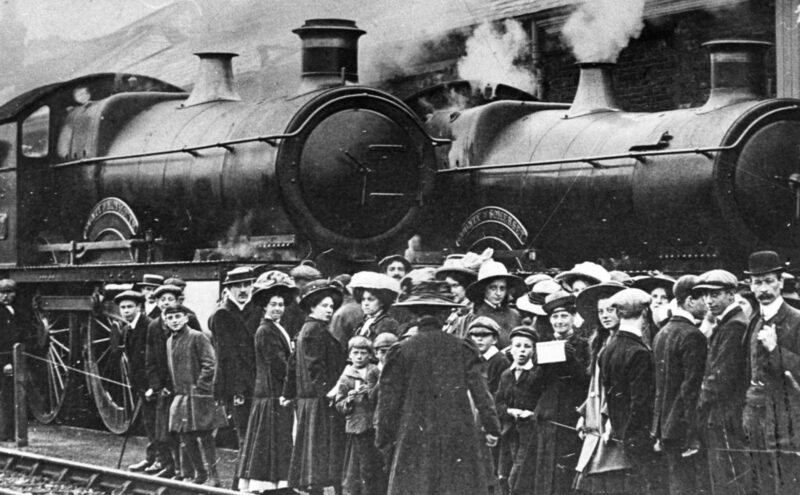 The railways were starting to become a key part of the nation’s holiday-making. Holiday Trains explains how that situation developed. 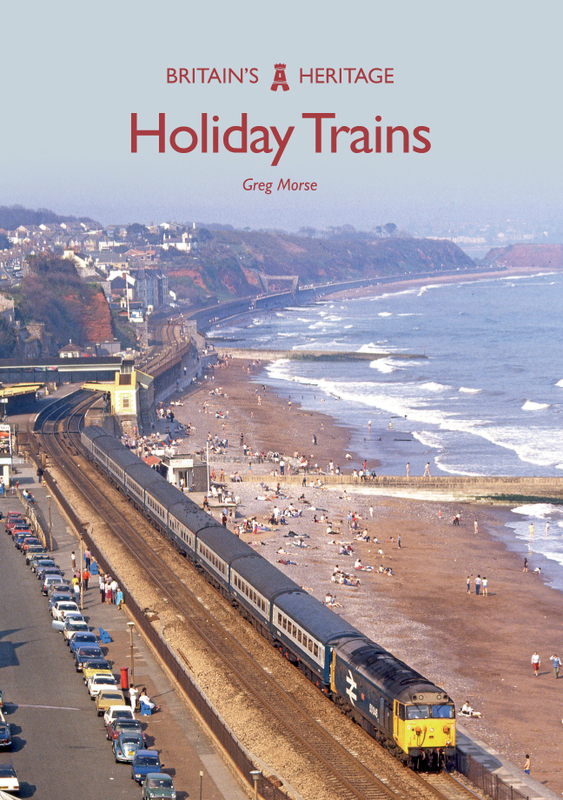 Greg Morse's new book Holiday Trains is available for purchase now. 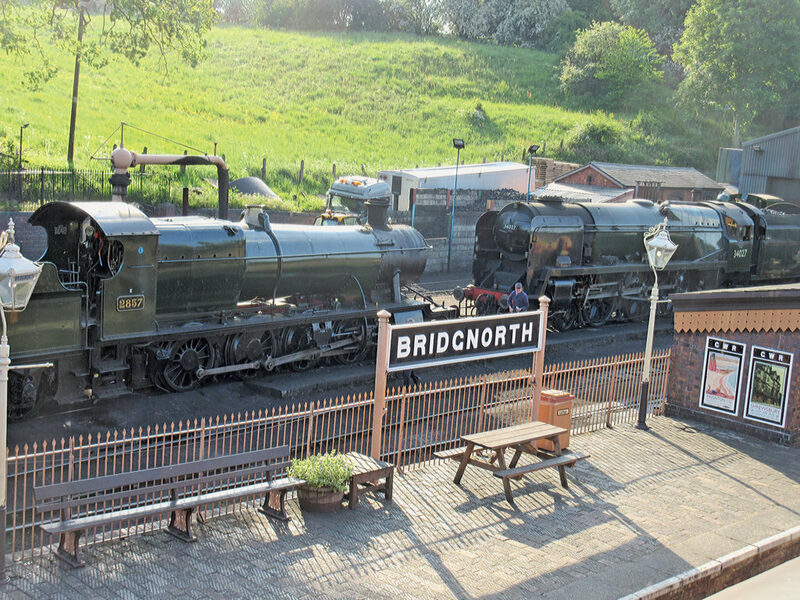 This entry was posted in Blog and tagged Holiday Trains, Britain's Heritage Series, Greg Morse, Steam Trains, Transport, Trains, Amberley Publishing, railways on April 18, 2019 by Amberley Publishing. 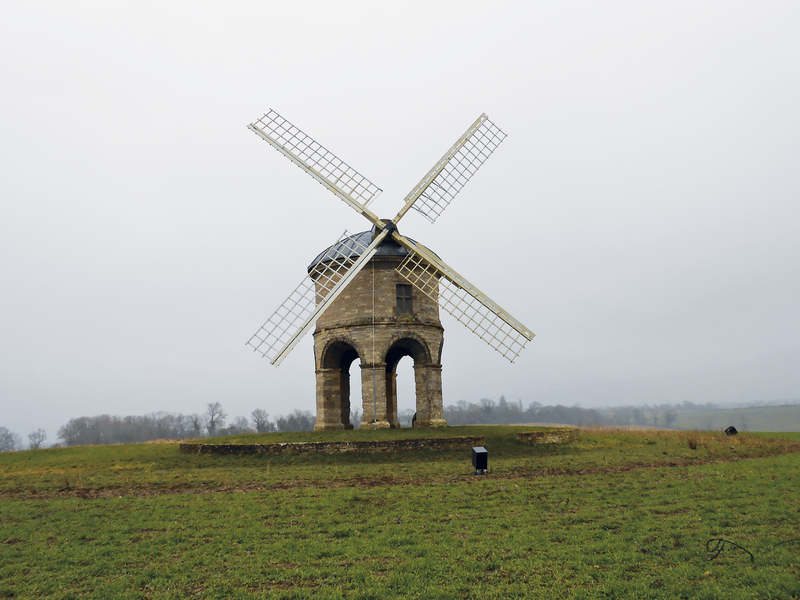 When I was asked to put together this book for Amberley, I knew it was going to be a challenge. After all, how does one comb through over 10,000 photos of trains and select the best images to present to readers? What lines to pick? What engine models? In this blog post, I’m going to give a behind-the-scenes look at how I arrived at the selection process for the images used in this book. The first thing I looked at was variety. Since the topic of the book is locomotives, I wanted to include as many different locomotive types as possible. With the monotony of modern diesel power in the form of EMD SD70 variants and GE GEVO models, this was no easy task. While I did not include EVERY type of engine currently in use, I feel the book presents a realistic look at what is currently used by the major railroads. The second criteria I used was scenery. The Eastern region of the United States can range from vast mountain regions around Pennsylvania and Virginia to virtually flat plains of red clay in the Carolinas. In my selections, I used shots I felt captured the flavor of each region: the quaint countryside dotted with family farms in eastern Pennsylvania, the mountainous and gritty coal country of West Virginia, the dense and populated commuter towns in New Jersey, the urban setting of downtown Atlanta. It was key for me to not just show you, the reader an image of an EMD SD70ACe for instance, but to show it as part of the bigger picture. 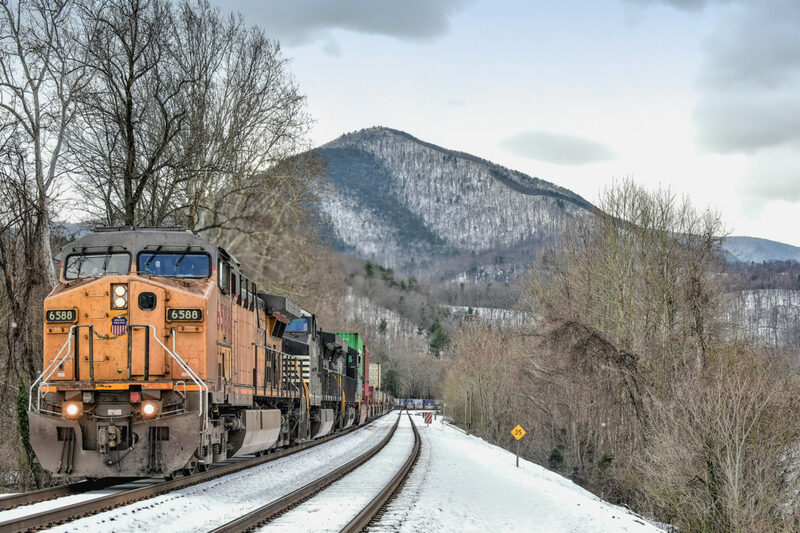 Too often, rail photographers will focus on the train and ignore the greater surrounding scenery. By doing that, you tend to lose the feeling of the area in which you are shooting. The third condition on my list was consistency. While I did make a few exceptions by including older photographs, I made a conscious decision to use only photographs taken with my current model of camera – the Nikon D4S. The quality of the image produced by the D4S really jumps out at you, and I wanted to use the best quality shots for this publication. My final point was to try and include an assortment of railroads that run on the east coast. 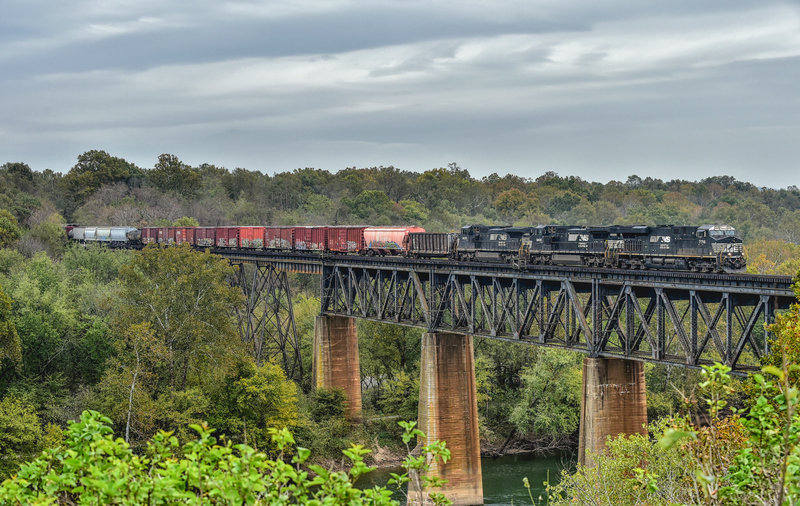 Due to traffic density, line proximity and fitting in trackside time, the photos used in the book tend to favor the Norfolk Southern railroad. While the black and white scheme used on the NS diesels is nothing to write home about, I feel the settings in which the trains operate make up for the lack of color on the engines. I hope as you page through the photos in this book, it gives you a sense of not only the engines in use on today’s railroads, but also a glimpse into the regions of America these trains traverse and the industries they serve. 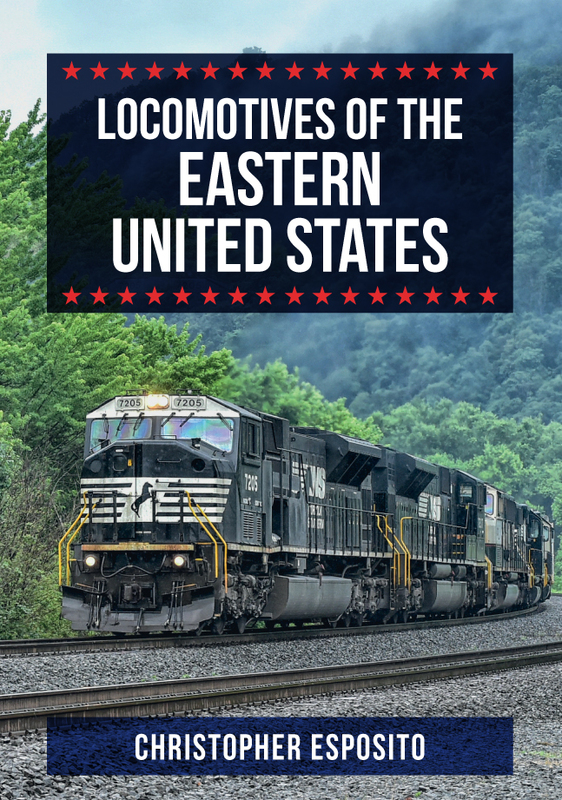 Christopher Esposito's new book Locomotives of the Eastern United States is available for purchase now. This entry was posted in Blog and tagged US, Eastern United States, Christopher Esposito, Locomotives of the Eastern United States, Locomotives, Transport, Trains, Amberley Publishing, railways on March 4, 2019 by Amberley Publishing. When it was suggested that I write a book about US Air Force bases in the UK, I jumped at the chance. After all, as the chairman of a museum dedicated to one base in particular, I knew I had a solid foundation on which to build. Shortly afterwards, though, I began to wonder if I had the tools for the job. My first task was to determine exactly how many US Air Force (USAF) bases there had been. This was no easy task, especially considering that the USAF and its antecedents – the US Army Air Corps and US Army Air Forces – had been in the UK since 1942. After some time, I concluded that there had been approximately 186 airfields used by the Americans at one time or another. This was not counting those that were allocated to them by the British and never actually used (probably another 40 or so); nor their support and non-flying facilities, which numbered around 300. Even a lengthy USAF report compiled in 1985 failed to fully determine the actual number of wartime American installations in the UK. So how to write about such a huge, undefined subject with a limited word count? My foundations were looking decidedly weak. With so many disused bases around the country, it would have been easy just to list each one and give a brief description of its current condition. 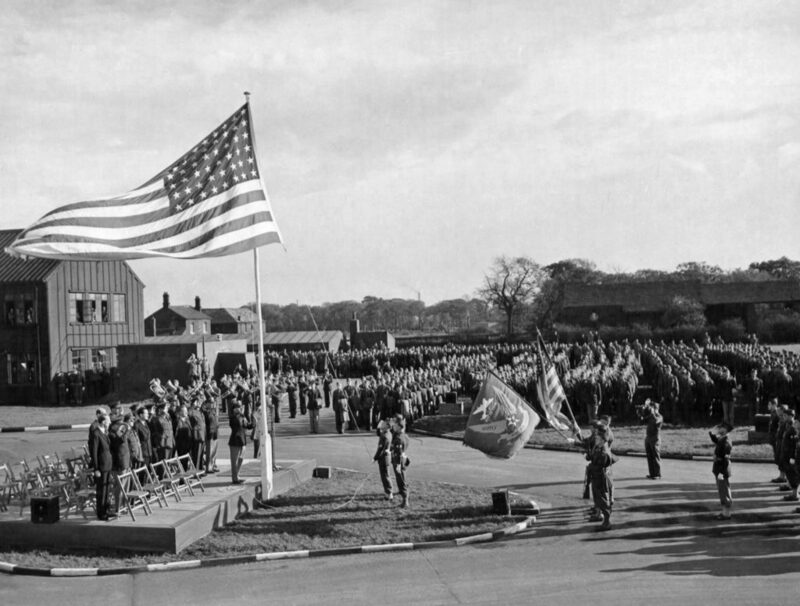 However, for a reader with scant knowledge of the story behind the USAF’s presence in the UK, it would have failed to answer two very important questions: why was a particular airfield given over to the Americans, and why was it built where it was? The most logical way of answering these questions was to build a chronological picture of airfield construction and use. Starting with the earliest American air force arrivals (but always bearing in mind those airfields that are still in use with today’s USAF), I began compiling a timeline of events running from January 1939 to the present day. Using this as the basis for a narrative, I then decided to ‘thread’ the story of present-day USAF facilities throughout, whilst highlighting other wartime airfields that had either continued to be used by the USAF post-war, or had particularly interesting back stories, i.e. emergency and advanced landing grounds, and those built by the Americans themselves. It must be said that my research was the easy part. Having a passion for a subject that I had a basic knowledge of meant that I knew roughly where to look. Putting it into words, however, was much more difficult. Using the timeline as my guide, I quickly realised that the restricted word count would mean that I could only focus on a limited number of bases. 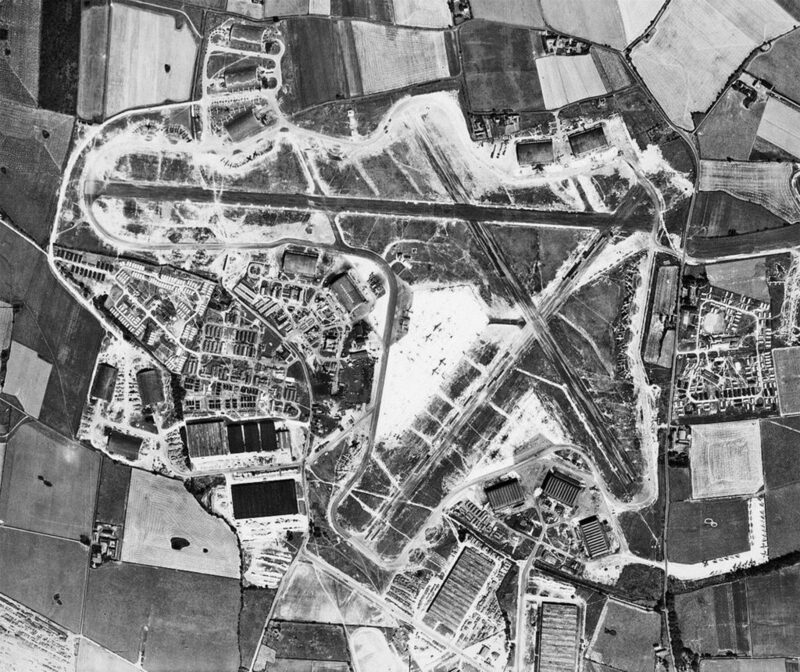 As a result, I decided to select 50 airfields and other facilities, including those still in use today. But this presented me with another challenge. Throughout the writing process, I was mindful of those who share my passion. Like me, many enthusiasts are devoted to particular airfields (in my case, the former RAF Ridgewell). I soon realised that by not touching on over 100 other American bases, I was risking the wrath of many in the airfield history community. Unfortunately, it was something that could not be helped, so I added a caveat to the preface and concentrated on the wider picture. Again, writing a limited number of words on such a sizeable subject was the most hindering aspect. Next, came the images. I already possessed a large collection of historical photographs, but I required some up-to-date shots of the bases as they are today. Thankfully, a very good friend and airfield aficionado came to the rescue. 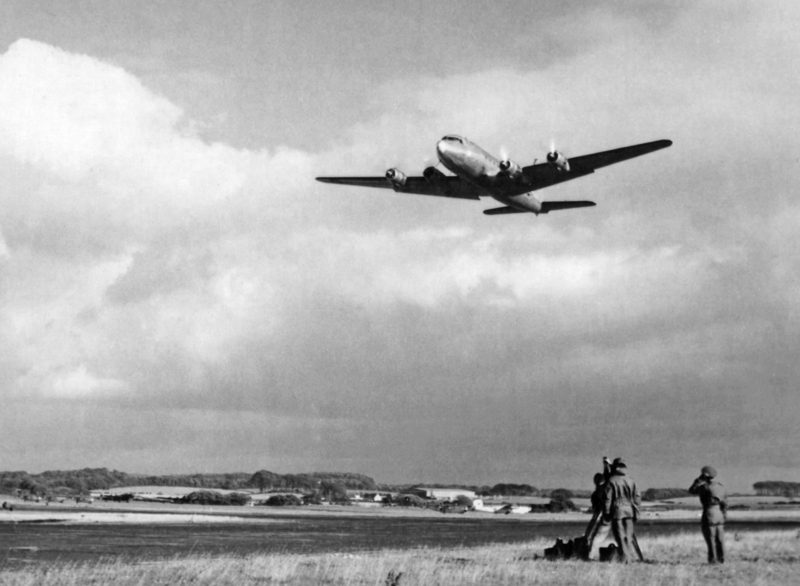 Richard E. Flagg has been on a mission to photograph airfields all over the UK. Moderator of various Facebook groups and content creator of the website, ukairfields.org.uk, Richard owns a fantastic library that he kindly gave me access to. The bulk of the images used in US Air Force Bases in the UK came through the lens of Richard. Finally, I began seeking a foreword written by someone highly regarded in the field of military history. I had given a small amount of assistance to the Battle of Britain historian, James Holland, for his most recent book, Big Week. To say I was overjoyed when he agreed to write my foreword is an understatement. Shortly after US Air Force Bases in the UK was released, I was invited to attend a book-signing event at the Imperial War Museum, Duxford. This was a huge moment for me, having been a volunteer tour guide in its AirSpace gallery for over five years. To see my book on the gift shop’s shelf (rather appropriately, below James Holland’s Big Week) was certainly a proud moment. But to sign it for other enthusiasts was the most humbling experience. Needless to say, when someone asked me if ‘their’ airfield was included, I was greeted with a look of despondency when I announced that it wasn’t. I guess this is the life of a writer – risking reputations to help educate others. One thing’s for sure, though – I now know I have the tools to build on something special. 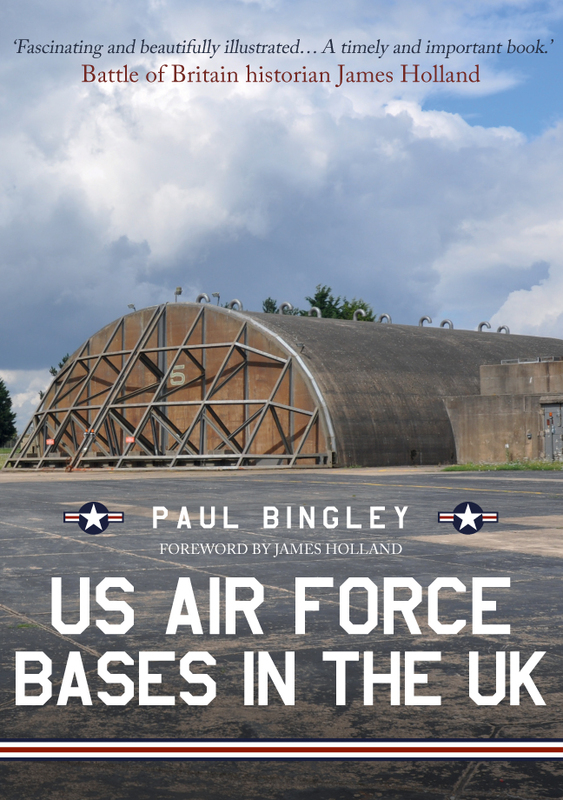 Paul Bingley's new book US Air Force Bases in the UK is available for purchase now. 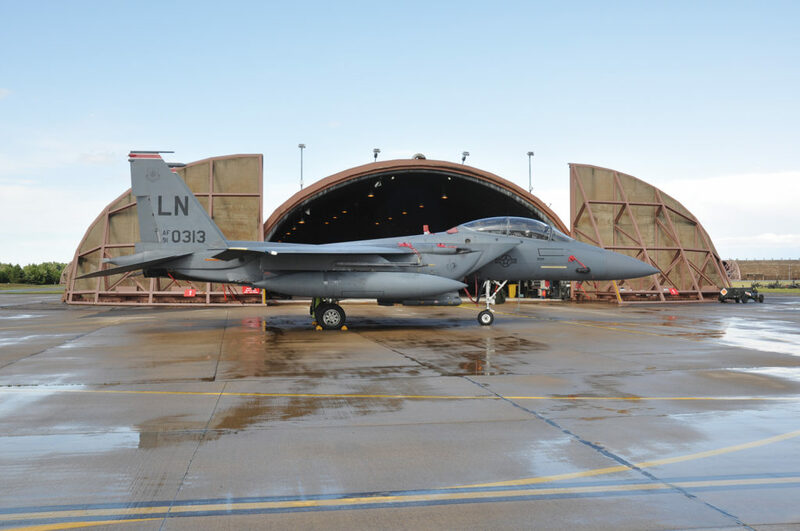 This entry was posted in Blog and tagged Air Force Bases, Airfields, USAF, US Air Force Bases, Paul Bingley, US Air Force Bases in the UK, Aviation, Transport, Amberley Publishing on February 21, 2019 by Amberley Publishing. 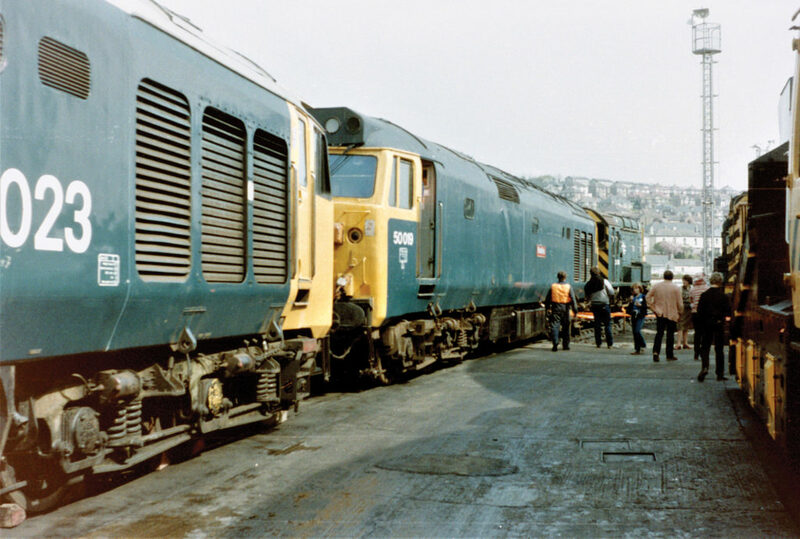 When my mate David, now exiled in France, made me custodian of his collection of railway photos from the early 1980s it sparked the idea of compiling a book recalling our teenage years, misspent bunking BR diesel depots. Wishing to include as much variety as possible I decided the book would encompass two decades, from 1970 to 1989. In 1970 I was six years old and my Dad was taking me to ‘watch the trains’. 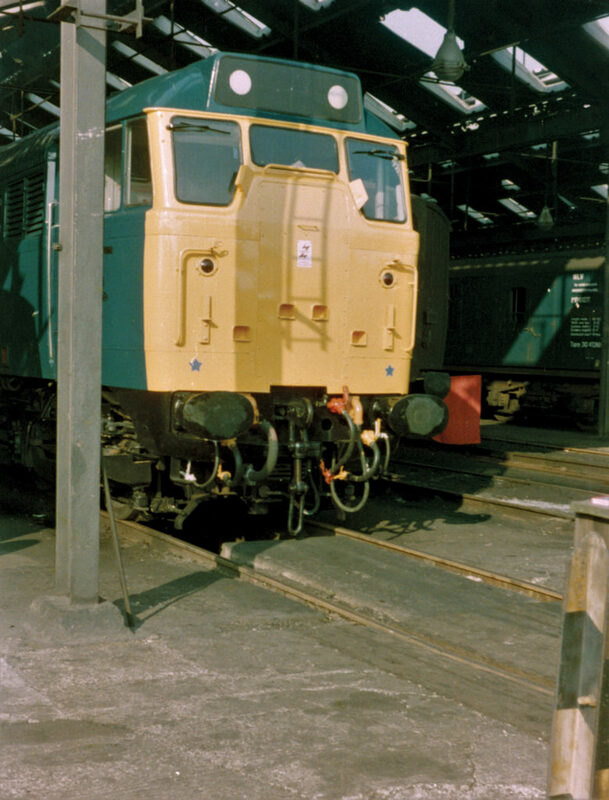 On these trips I can clearly remember seeing Clayton Type 1s dumped at the back of Tyne Yard. It wasn’t until 1978, aged fourteen, that I was allowed to go independently to Newcastle Central station. The cost of a return from Tynemouth and a platform ticket was less than 10p. I quickly made friends with other ‘platform-enders’, forming lifelong friendships. 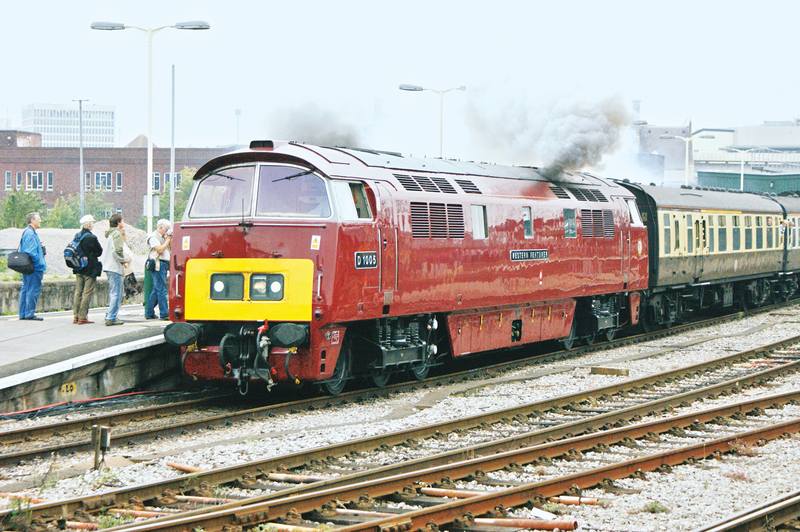 Forty years later, we still go on rail-tours and to preserved diesel galas together. The west end of Central station provided a tantalising glimpse across the Tyne to Gateshead depot. A walk across Robert Stephenson's High Level Bridge led us via the old NER Greenesfield Works to the shed foreman's office door where we made the mistake of knocking and asking permission to look around. Having been chased off, next time we knew better and just sneaked in up the bank beside the King Edward VII Bridge and through a hole in the fence, to the sidings known as the ‘ash-heaps’. We soon progressed to travelling, usually with the excellent £2.60 weekly Northumbrian Ranger ticket. We mostly ‘bashed’ Deltics between Berwick and York but always made time to visit Carlisle’s Kingmoor shed. On all but one occasion we were flatly refused entry by the ‘gadgie’ in the office so we’d trudge back over the bridge, forced to view the locos across the main line from rusty sidings which often contained withdrawn locomotives awaiting disposal. They led to one of our favourite vantage points, the Waverley route bridge and its view of the secondary shed in the marshalling yard. We began to travel further afield in our quest for diesel exotica, and found Scottish shed foremen far more amenable to scruffy youths wandering about than their Gateshead and Kingmoor counterparts. The Ian Allan Locoshed books became indispensable, providing directions through the dodgiest parts of Britain's towns and cities to depots. My friend Tim and I, then aged 12 and 14 respectively, had been taken by his parents to Glasgow for the day. The grown-ups set off shopping, leaving us kids to visit Eastfield shed. Like many depots it was surrounded by run-down estates and we soon became aware we were being followed. Turning, I saw a boy about our age, but looking much ‘harder’ than us (not difficult), accompanied by a much older lad who looked even scarier. What caught our eye was that one wielded a half-brick while the other carried a bike chain. We ran as fast as we could but Tim’s legs could not carry him fast enough. I made it to the security gates of The Metal Box factory and got the guards there to rescue Tim. Our assailants scarpered but not before robbing Tim of what little cash he was carrying. The police were called and soon we found ourselves in a scene from “Rab C Nesbitt”, riding the tenement streets in a ‘jam sandwich’ squad car on the lookout for the baddies. 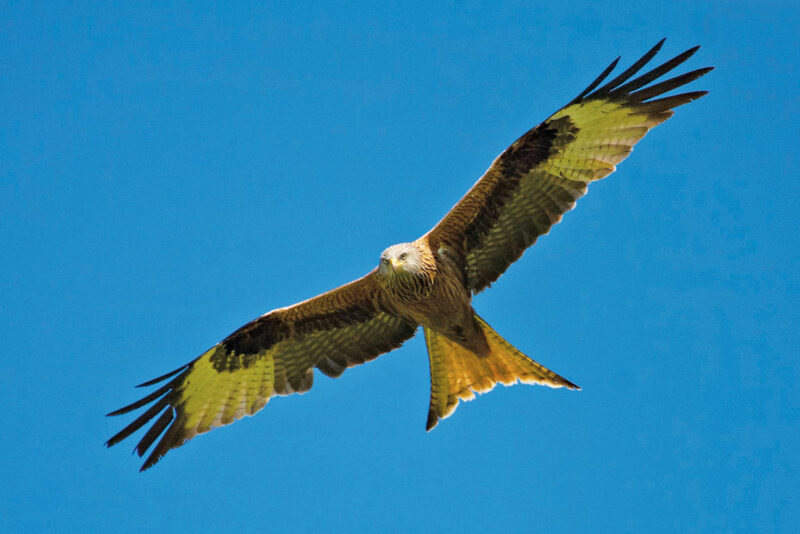 Our description of the older of the two matched that of one of their most wanted, and soon enough we spotted them. He and his younger sidekick were hauled into the back seat and the former was literally sat on by the arresting officer for the journey to the ‘nick’, six of us jammed into a five-seater car! Their pockets were emptied, the contents given to us and we were sent on our way. A tidy profit was made and nothing was said to my friend’s parents. On another occasion, having used Merseyrail under the river to get to the sheds in Birkenhead, I lost my ticket and had no cash, and had no means of boarding a train back to Liverpool. Imagine the look on the ticket vendor’s face when I asked where the nearest bridge was, thinking I could simply walk back over the river. I now know that it is approximately a 25-mile walk to the bridge at Runcorn. Fortunately he took pity and let me fare-dodge back under the Mersey. Whole weekends would be planned around shed-bunks. Just after my sixteenth birthday six of us travelled overnight from Newcastle to London. Three of us travelled in style behind Deltic 55012 CREPELLO to York then 55009 ALYCIDON the rest of the way to the capital, arriving in the early hours of Saturday morning. 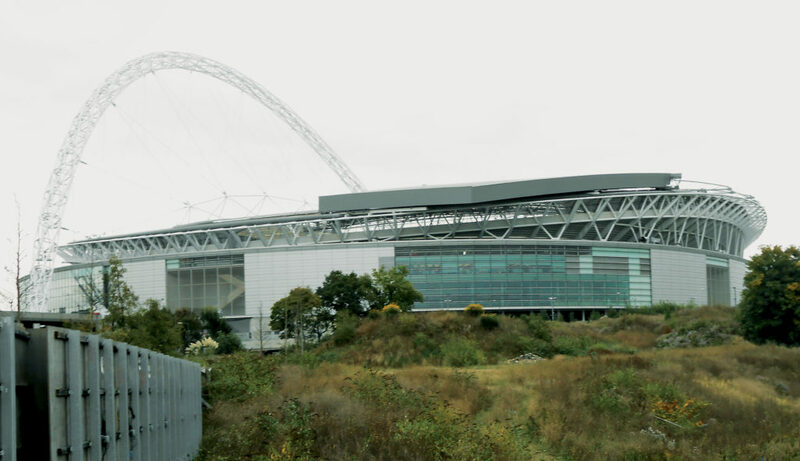 The other three lads were not so well-off so they met us at Victoria off the overnight National Express coach. 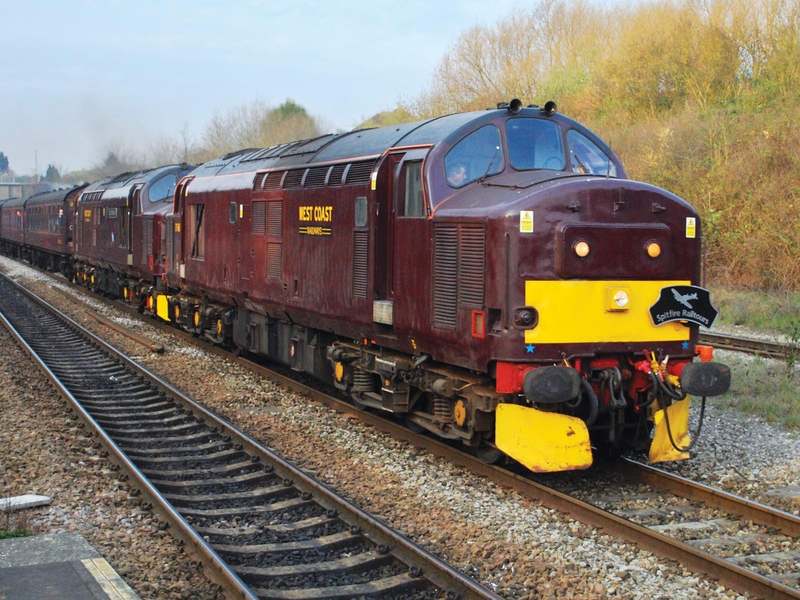 We visited Clapham Junction, Selhurst and Hither Green with their Class 73 electro-diesels. Then followed the trainspotters’ mecca of Stratford to see the last remaining Class 31/0s. The North London line took us to Willesden where AC electrics awaited, then trudged down the road to Old Oak Common to see Class 50s. Our trip was concluded with more Deltic haulage behind 55014 THE DUKE OF WELLINGTON’S REGIMENT overnight from King’s Cross, with diversions via Lincoln and the Leamside line, while our mates suffered another night on the M1 and A1. We all got home early next morning, tired, filthy and happy. If the varied contents of BR’s sheds were not interesting enough, it was even more exciting to visit the workshops of British Railways Engineering Ltd, normally accessible only on open days. Dad came up trumps, taking me to open days at Doncaster in 1978 and Crewe in 1979. These events introduced me to the unforgettable smell of the paint-shops and the fascinating sight of locomotives being built, overhauled or scrapped. 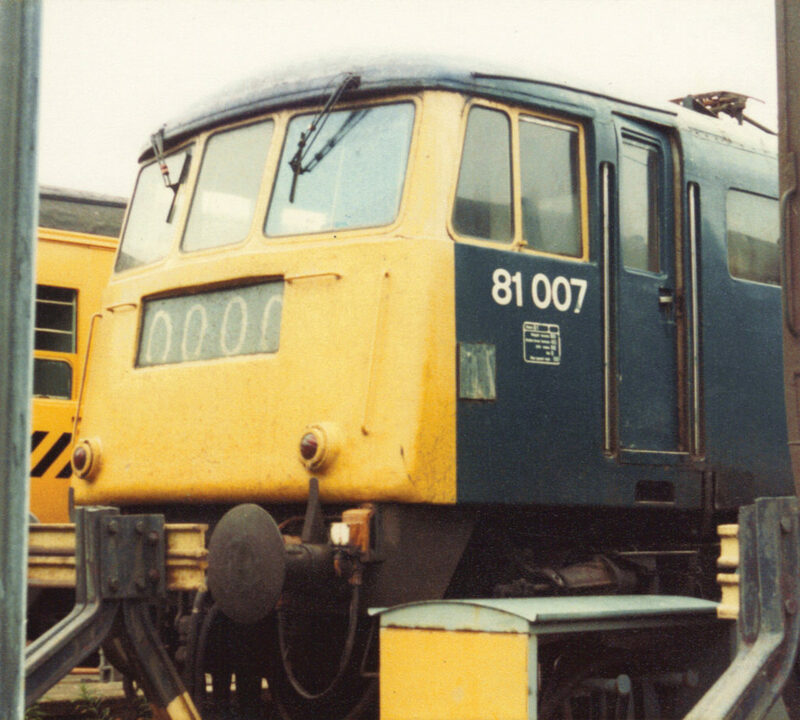 The most memorable open day was the “Deltic D-Day” at Doncaster, in February 1982. Thousands of enthusiasts converged on the town to pay their last respects to the survivors of the class, all having been withdrawn from service and several having already been cut up. Open days were fine but their very legitimacy meant they weren’t a patch on blagging our way into a location where we shouldn't be! 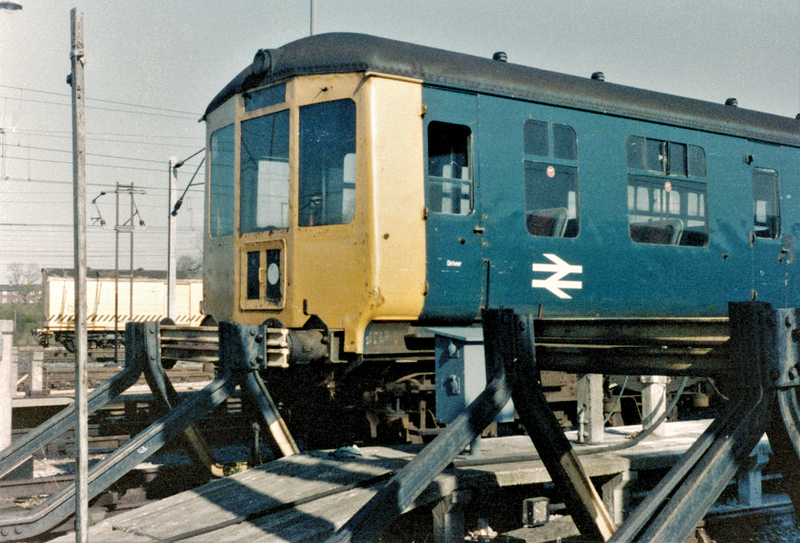 Perils associated with shed visits were unlit inspection pits, oily puddles, tripping hazards and moving trains. Southern Region depots offered a 750vDC third rail as an additional danger, but we are all still here. It is difficult to imagine in today’s era of health and safety that enthusiasts were ever allowed to access such facilities! 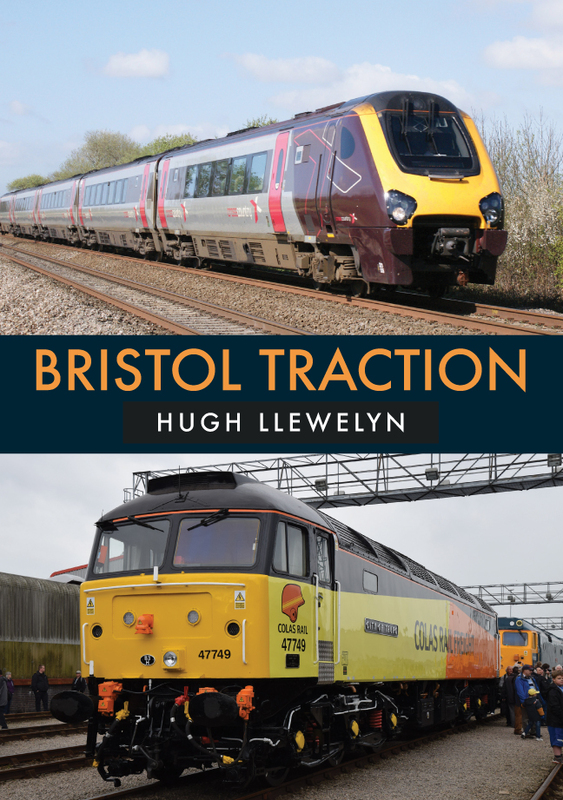 In this book I have assembled a collection of photographs that show the widest possible variety of traction in the principal depots and works all over the network, along with many of the lesser installations. 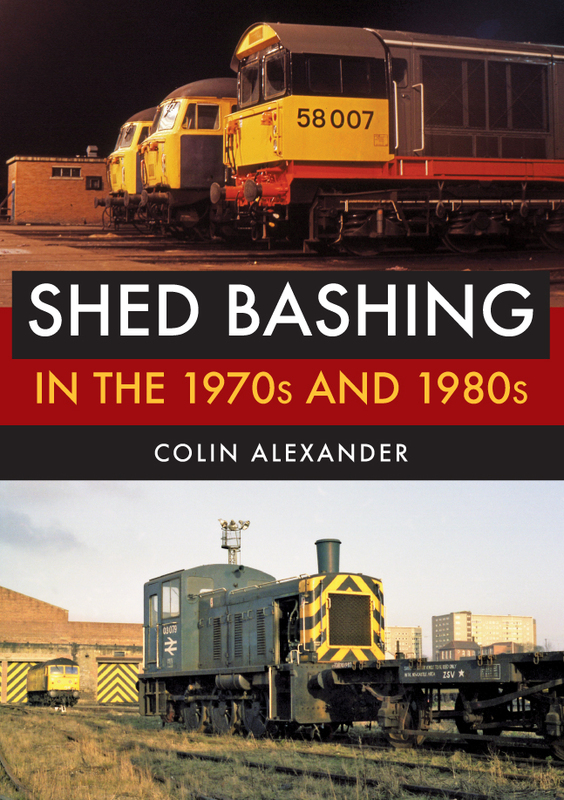 Colin Alexander's new book Shed Bashing in the 1970s and 1980s is available for purchase. This entry was posted in Blog and tagged Shedbashing, Shed Bashing, Shed Bashing in the 1970s and 1980s, 1980s, 1970s, 20th century history, Locomotives, Colin Alexander, Transport, Trains, Amberley Publishing, railways on February 14, 2019 by Amberley Publishing. A gap of just over sixty years separates my two visits to the delightful little Welshpool and Llanfair Railway. 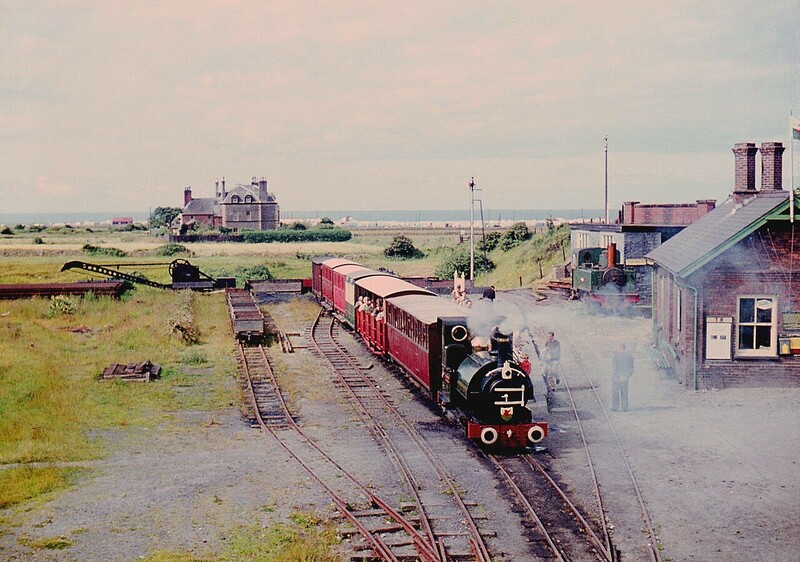 Today it is an important and successful tourist attraction; back in the 1960s it was a fledgling heritage railway short on money and equipment, but long on enthusiasm and ambition. 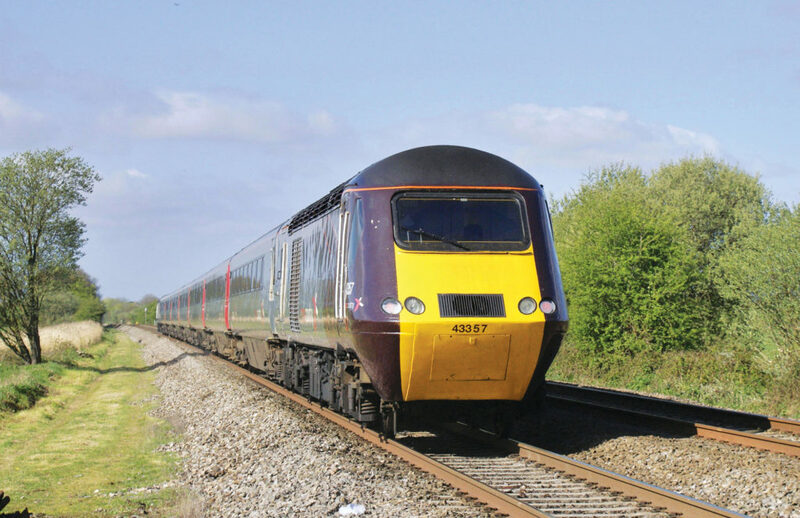 Like many old lines, British Railways finally gave it the axe in the mid-1950s, mothballing the two little engines and allowing the route to succumb to nature. But as with so many old railways, especially narrow gauge lines in Wales, there always seems to be someone out there with a Grand Plan. In this case a group of volunteers gamely revived about half the line and it was in this pioneering state when I went for a ride. Compare that with today’s prosperous situation. There is a generous sized booking hall and bookshop (lots of Amberley books – ‘Would you sign some for us please?’). I duly obliged. The engines and coaches are immaculate. At the end of the line I chatted with the driver and showed him some pictures on my phone from my forthcoming book The Railways on Wales in the 1960s. He gazed at them, identifying some of the early personalities who had been at the forefront of getting things going again in the 1960s. When the book appeared a short while ago I was delighted to send him a copy – and the bookshop manager assured me it would be a regular stock item for the railway. Going back to somewhere special after many years can be a mistake. It’s all too easy to rewind the clock with dewy eyes and overlook the negatives. 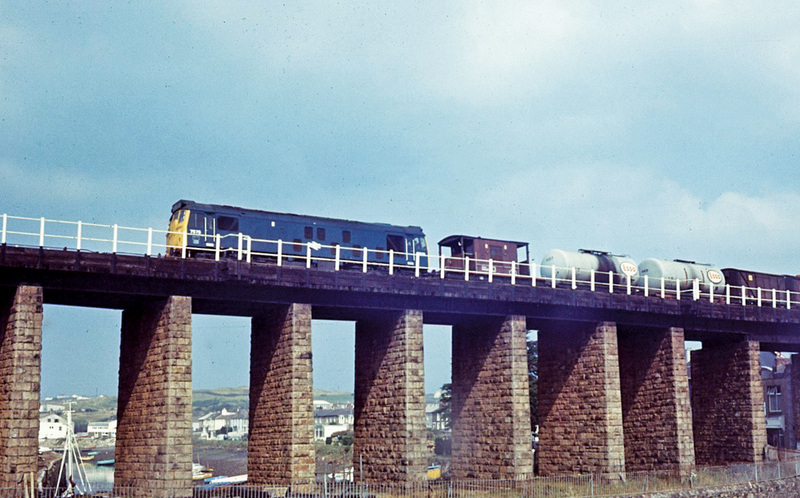 In the case of the railways in Wales, they are different today, but just as good. Better actually, as they are mature and vibrant parts of the Welsh tourist industry. 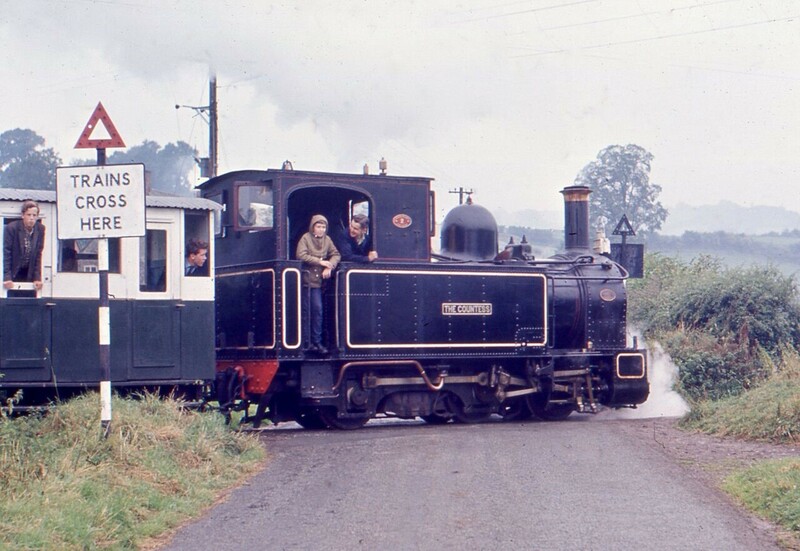 When I visited the Vale of Rheidol Railway in 1966 it was still run by British Railways. We drove there in my little cream Fiat 600. 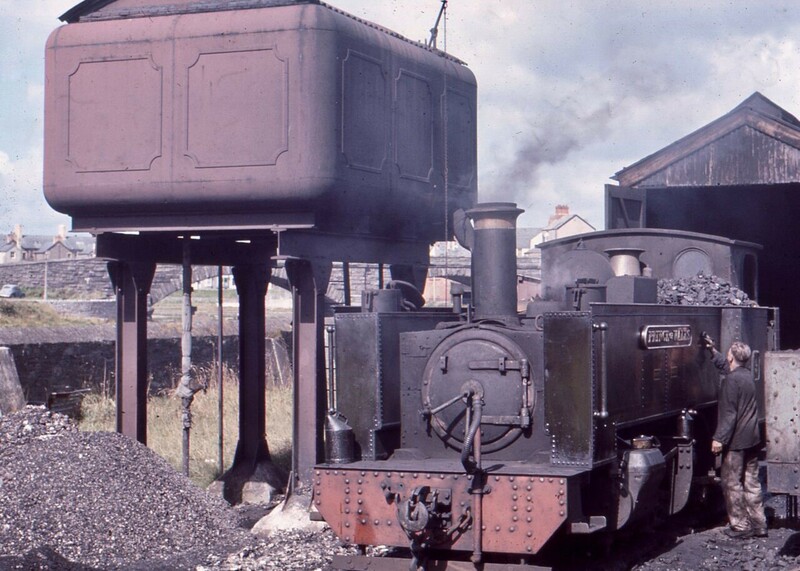 The crews did their best, but a clean engine was interpreted very differently on the Vale of Rheidol from enthusiast-operated lines like the Ffestiniog and Talyllyn. Today the Rheidol railway is also run by enthusiasts, and if a spot of oil appears somewhere on the engine, it is immediately wiped away to keep everything pristine. All this is wonderful for the average visitor, but dare I say I quite liked the old British Railways line with its driver in grubby overalls getting paid for doing an honest day’s endeavor. One of the pleasures of writing what I call ‘living history’ – putting a personal touch on events from years ago – is the letters and comments received about subjects being recalled. Of course it would be nice to have had some of these before the book was written! But you meet some wonderful people when researching your narrative. A young volunteer at the Ffestiniog Railway was peering at some pictures in my book and could hardly believe how ‘small and amateurish’ everything looked. Today the Ffestiniog is a big business, but – like other Welsh railways – it retains the intrinsic charm of the old days. In 1966, you could wander around workshops and possibly get a ride on the footplate if you asked nicely. These days, health and safety has reared its head and no doubt you would need a hard hat, training course and hi-vis jacket to do anything remotely like the escapades we got up to. But flicking through the pages of my book with an old friend who accompanied me on my railway adventures back in the 1960s was enough to prompt us into action. We’ve booked a cottage in Wales next summer and – now as a foursome – will relive our youth. Anyone know where I can rent a little Fiat? 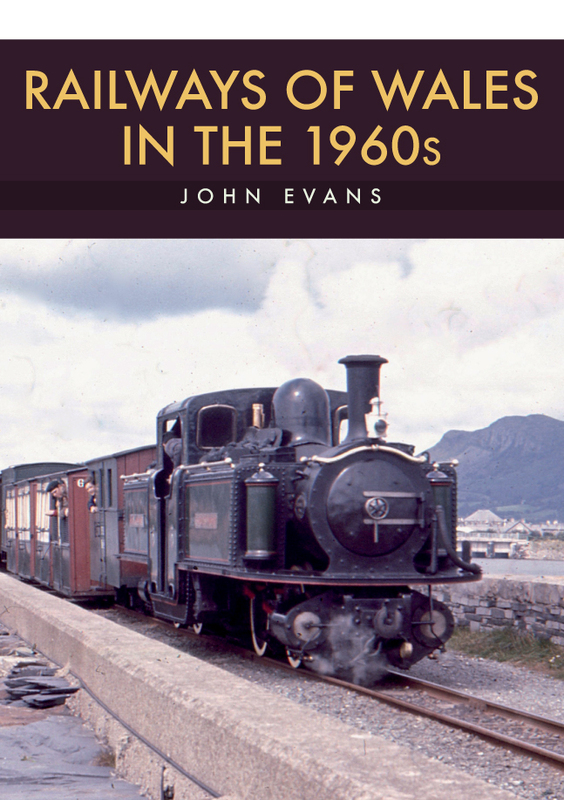 John Evans' new book Railways of Wales in the 1960s is available for purchase now. 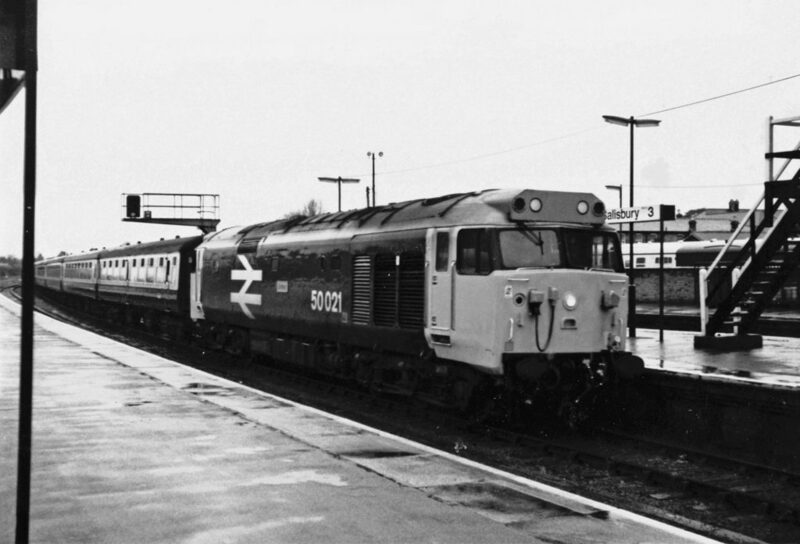 This entry was posted in Blog and tagged Railways of Wales, Railways of Wales in the 1960s, 1960s, Wales, John Evans, Transport, Amberley Publishing, railways on January 24, 2019 by Amberley Publishing. For as far back in history as I can discover, my family’s heritage has had some connection with transport; originally with horses and for the last one hundred years, what is now usually called “The Motor Trade”. Even though my own career choice took me into the high tech realms of computers, I’ve always had an interest in motor vehicles that seems to have stalled with the models from my youth and which are now cherished classic cars. Passing my driving test in 1974 at the first attempt and almost the earliest opportunity, my choice of transport was limited to the banger end of the market, but my attention was quickly drawn to some of my more affluent friends who were running models produced by Triumph. This was to be the beginnings of an enthusiasm that has now lasted for over forty years. With the aid of Hire Purchase, I stretched my apprentice’s wage to buy myself a slightly used Triumph 1300; somewhat more prestigious than the cars driven by my friends. Of course, I couldn’t afford it so the car stayed in my ownership for a very short period, but the seeds of enthusiasm for the products from Triumph were sown. Along the way, I have owned a couple of classic Triumphs from the 1970s and found myself editing club magazines which led to an approach from Amberley initially to create a book on the Triumph “big saloon” – the 2000 / 2500 (Triumph 2000 – Defining the Sporting Saloon). Clearly, Amberley were happy with the result as they were quickly back asking me for a further title. It would be a second Triumph model range and the one that had always fascinated me was the middle market 1300 which morphed into the Toledo and Dolomite, staying in production for far longer than the planners could ever have considered. Triumph as a brand and company itself is a fascinating story of sequentially grasping success from the jaws of failure and clever engineering innovation developed on a shoestring. The first iteration of the company went out of business in 1939, was rescued by the Standard Motor Co. in 1945, it nearly went bust again at the beginning of the 1960s and was rescued by Leyland Motors who were later encouraged into a mega merger with BMC to create British Leyland. And we all know how that ended. But the 1300 was a success story that deserves to be told. Taking a different approach to the mechanical layout for front wheel drive as defined by Alec Issigonis with his Mini and 1100 designs for Austin and Morris, Triumph employed the leading Italian stylist Giovanni Michelotti for the overall design of the car which resulted in an attractive package that sold at a premium in the market for medium sized family cars. A larger engined model was soon offered and then something most unusual happened. With the market heading towards front wheel drive, Triumph converted their car to rear wheel drive with the launch of the Toledo model. In parallel, development work was taking place on a new range of engines to power Triumph models into the future. One of these was a modular four-cylinder engine that was, in essence, half of the engine that provided power for Triumph’s flagship model, the Stag. This engine was first used by Triumph in a revision of the 1300 / Toledo model range that was launched with a model name that was borrowed from Triumph’s heyday in the 1930s – Dolomite. 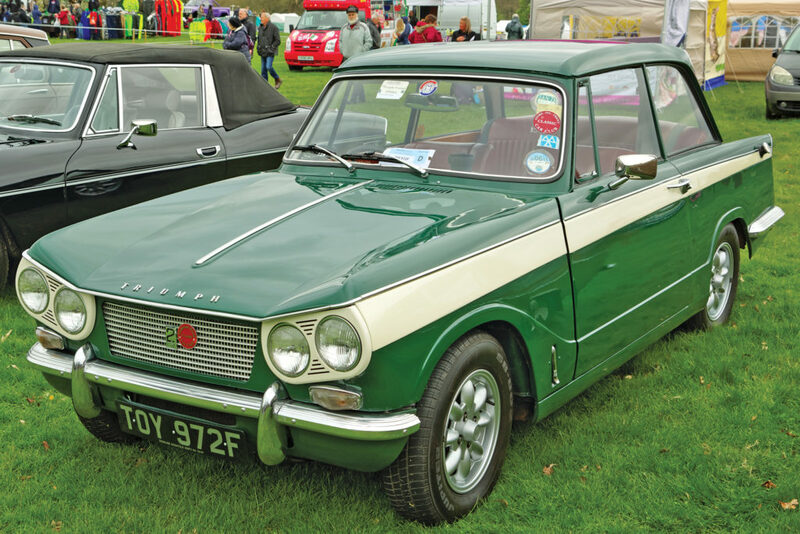 In the background, the business was in turmoil following the British Leyland formation with Triumph managers being moved to the volume Austin – Morris division and senior staff from the former rival Rover Company taking control at Triumph. The designers knew that the new engine had the capability to develop more power and investigated ways in which to achieve this. Multiple inlet and exhaust valves had been used by other car makers to extract more power, but such installations were expensive to implement and in the case of the Triumph engine would have required extensive redesign. Instead, an ingenious solution was adopted by Triumph in the engine that would power the famed Dolomite “Sprint” model and an explanation of how this was achieved is contained in the book. With the model range having now long exceeded its original design life, some commentators thought the car was looking decidedly old fashioned but it continued to sell in volumes acceptable to the management. 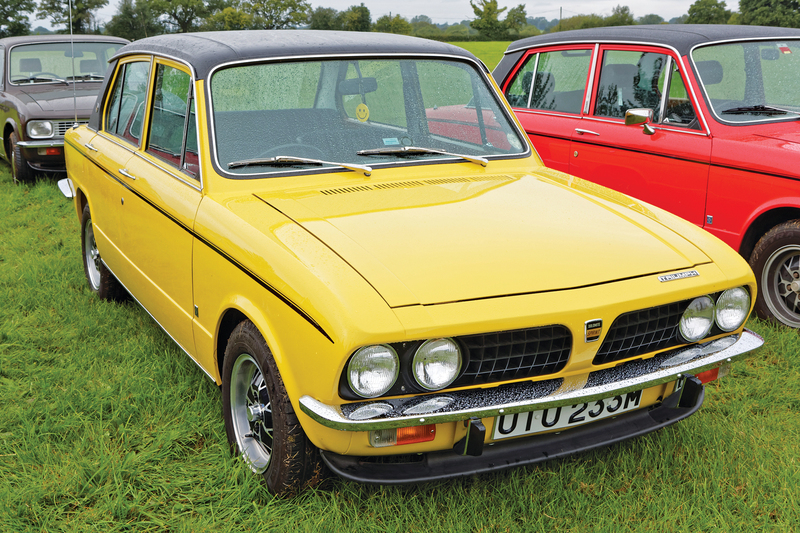 Despite a series of aborted attempts, there was no funding to provide a replacement model with the Dolomite range soldiering on to remain as one of the last Triumph designed models to be built. Triumph as a brand name suggests sporting success and while one might normally consider the more overtly sporting models such as the TR or Spitfire to take the honours in this arena, the original 1300 had great success, although only for a short time, in the new sport of Rallycross but it was the Dolomite that was to gain sporting honours for Triumph both in rallying and saloon car racing. Triumph 1300 to Dolomite Sprint tells the whole story from a brief background on the origin of the business, the route from rescue in 1945 to the introduction of the 1300 model and the full story of the evolution into the final “Dolly Sprint” models. Lightly interwoven within the model evolution is the inevitable business politics that help to understand with hindsight the issues that confronted the British car industry during the 60s and 70s. We look at the abandoned plans to replace the model and conclude with a section on the success of the cars in motor sport. 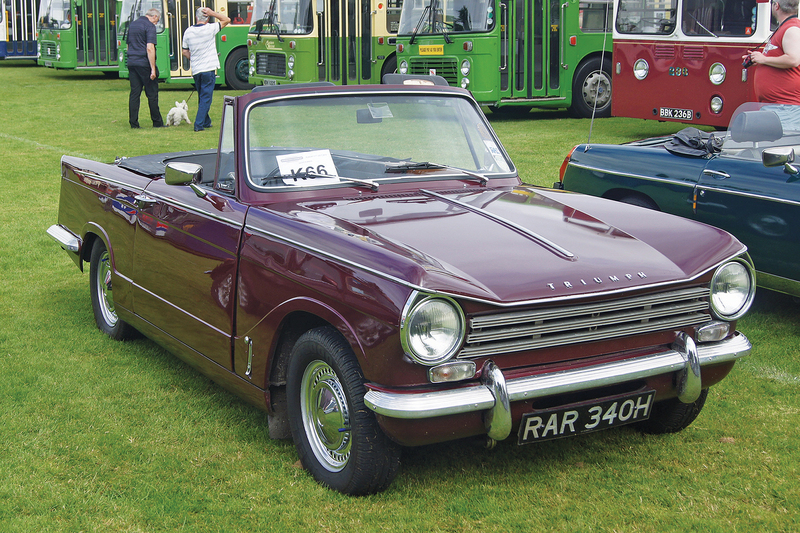 Each model type is illustrated with photographs of cars on display at various shows across the country and interspersed with reproductions of Triumph’s original press and marketing material, the motor sport section also includes a selection of images from the collection of former Triumph works driver, Brian Culcheth. 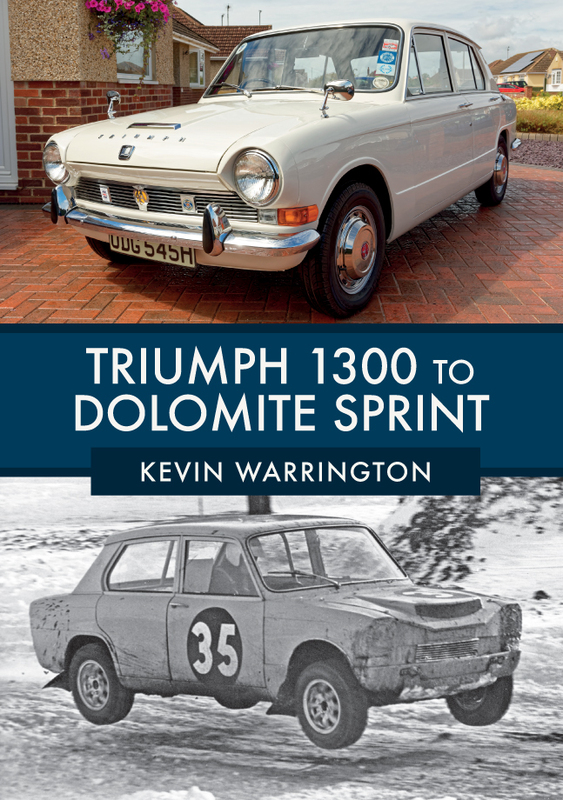 Kevin Warrington's new book Triumph 1300 to Dolomite Sprint is available for purchase now. 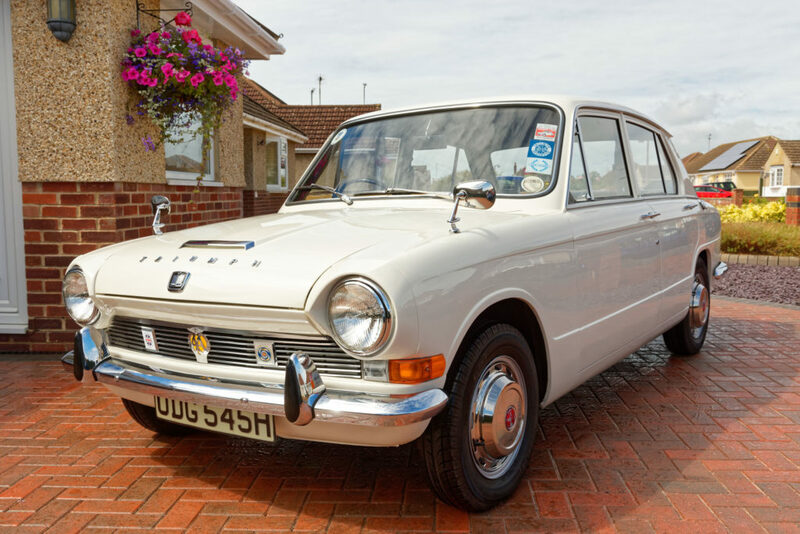 This entry was posted in Blog and tagged Motor Cars, Dolomite Sprint, 1300, Triumph 1300 to Dolomite Sprint, Cars, Triumph, Kevin Warrington, Transport, Road Transport, Amberley Publishing on January 23, 2019 by Amberley Publishing. Well, after nearly forty years of getting up at 04:50, or sometimes earlier, and arriving home at any time around midnight off late shift and being called out in the middle of the night, I thought retirement might bring some rest and leisurely days, but alas dear reader, that appears to not be the case. Compiling and writing a book of any size or layout, whether it be fiction or non-fiction, is not something that throws itself together overnight. I have also been very fortunate to work in an industry which is both my hobby and my career. For the most part it has been an absolute pleasure to go to work every day, even though that meant thirty-eight years of unsociable shifts, early starts and late finishes, working in Derbyshire, Cornwall and Devon as both Signalman and Supervisor was a privilege. Ironically, travel seemed easier in those distant days from our past, several decades ago. Aside from there being more trains to locations, the lack of restriction of travelling alone in one’s younger days did not impinge on the more adventurous of us that struck out to locations that could only be dreamed of now by anyone of a similar age. I say ironically, because unlike today, with our modern communications, when one left home for an adventure in the 1960s, even as a twelve or thirteen-year-old, you had little chance of contacting your parents unless you used a public phone box, and assuming home actually possessed a telephone. This collection of photographs depicts journeys similar to those I undertook as a teenager, but made by friends of mine setting out to explore the railways and trains of the erstwhile Western Region of British Railways during the latter years of the previous century. 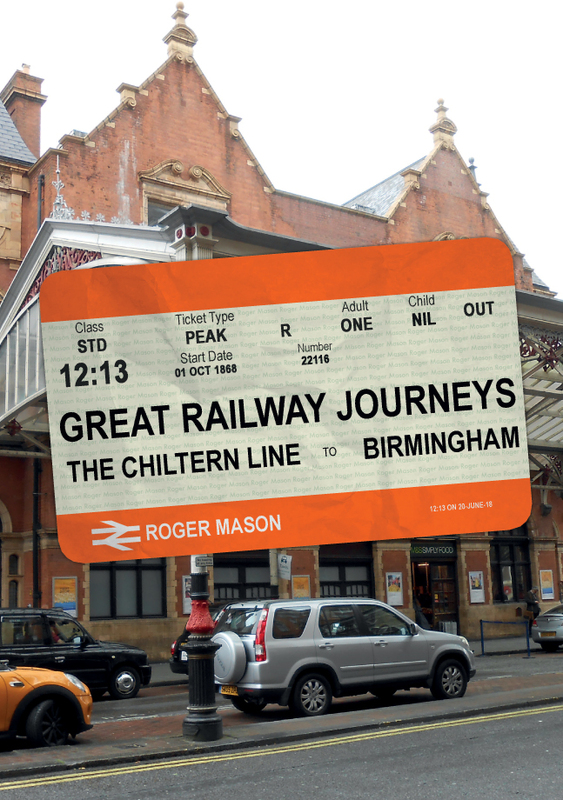 With a wider choice of routes and trains available just a few decades ago, it was easier then to achieve the desired locations and in this case return home the same day. There were of course many traction types to be seen in and around the West Country during the 1970s and 1980s and of course, at the time, they were common traction types and not thought of as anything unusual, but, like all things in everyday life, complacency creeps in and one just never thinks that this status quo of things is one day not going to be there. A fitting reminder of halcyon days, as the current railway stumbles around trying to get it right, and frequently failing! In being invited to produce some more books on my favourite subject of public transport I asked some of my many like-minded friends if they wished to contribute to this particular book, and of course, they said they would like to. As I have mentioned previously, compiling and writing books on any subject, including fiction and subject specific titles, is not as easy as one might presume. It involves countless hours of research, photographic reproduction, digital cleaning and correcting of old and sometimes damaged negatives, slides and prints. This all has to be set out to a strict and precise format as demanded by the publisher. The final product, its presentation, publicity and promotion are all done by the publishers of course, but is usually with agreement of the author on such things as the covers. Showcasing a friends or former colleagues’ photographs to display them to best advantage is therefore no easy task and that is why the publishers and biographical authors put their name on the front, even though the content or most of the content was not produced by them originally. The photos in this book are not arranged in any particular order, so dates and locations are randomly arranged to try and keep the reader interested. So, having said all that, here is my fourth book on Railways. After much tapping of keys, extensive research, photo preparation and hundreds of hours writing and compiling the book, I hope you find it enjoyable, and that there aren’t too many mistakes. 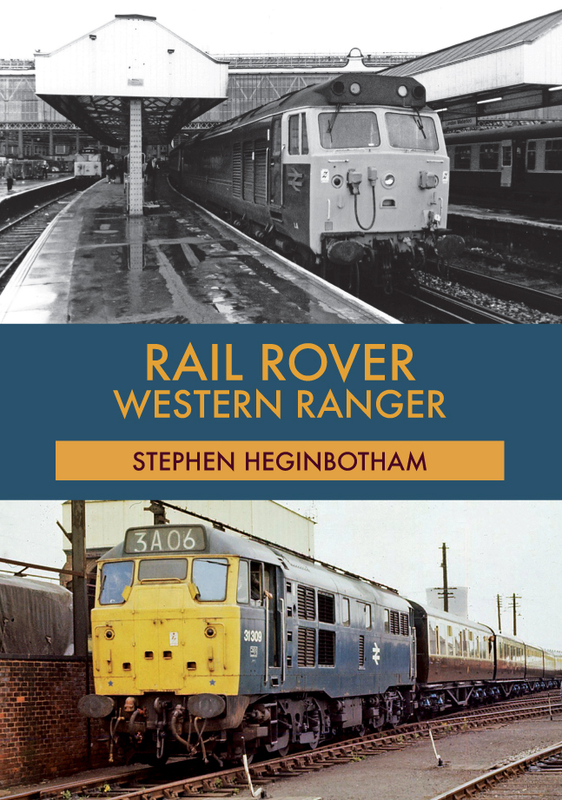 Stephen Heginbotham's new book Rail Rover: Western Ranger is available for purchase now. 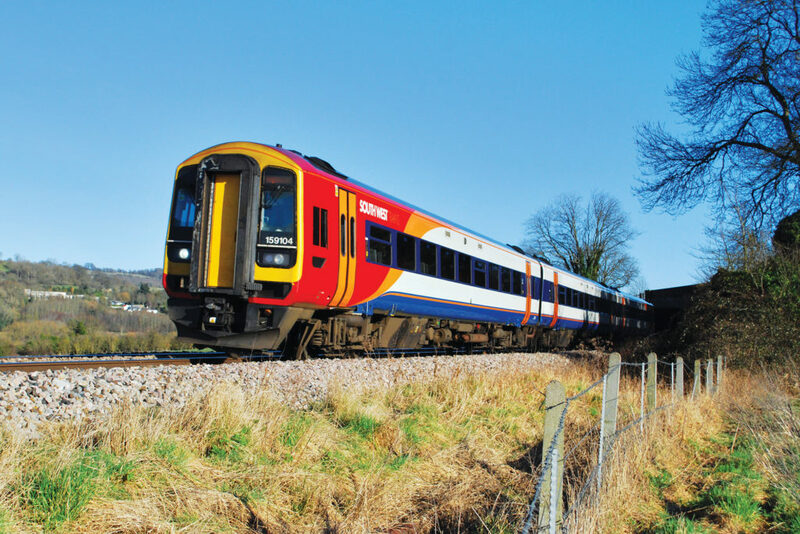 This entry was posted in Blog and tagged Western Ranger, Rail Rover, Rail Rover: Western Ranger, Stephen Heginbotham, Transport, Trains, Amberley Publishing, railways on January 18, 2019 by Amberley Publishing. For over 130 years the steam locomotive dominated Britain’s mainline railways. It seemed that almost every little boy (and some little girls, too) wanted to be an engine driver. Thanks to the railway preservation movement (thanks to the efforts at Tal-Y-Llyn in Wales and Middleton in Yorkshire) the dream of being an engine driver can be fulfilled by anyone with an aptitude for the hard, mucky, work on the footplate of a steam locomotive. My own fascination with railways stems from my mum: my parents were part of a locomotive owning-group (I think it was an 8F) which sat for years in the coal yard on Cross Lane in Wakefield. There is a family link to the railways too with one ancestor being Station Master at Snaith in East Yorkshire. Mum had an N-gauge layout and regular pilgrimages were made to the NRM in York; to the Worth Valley, and to the Yorkshire Moors. The dog came too, of course. I think the first steam hauled train I ever travelled on was headed by City of Wells at Keighley. Fast-forward 30 years and I started at the Museum of Science & Industry as a Railway Volunteer in summer 2015. I’m fascinated by the early railways (and indeed, have lectured on them) so getting a chance to work with a replica of Planet – the world’s first express passenger locomotive – was the perfect opportunity. Learning how to clean, then fire and drive a steam locomotive. Talk about fulfilling a boy-hood ambition! The learning curve was almost vertical, but thanks to expert tuition, rapid. Firing a locomotive is something you either ‘get’ or don’t, and you discover that pretty quickly. It is a cliché to suggest that the Steam Locomotive is the closest thing we have yet made which comes close to artificial life. But it is probably true – every locomotive is different, has different ‘moods’, will perform differently every day: one day she (and they are all ‘she’) can be an absolute dream, but another will be the most frustrating thing on earth, and get called a wide variety of rude names. It is physical, filthy work, with long hours. But it’s fun with a massive sense of pride and fulfilment. You’re continuing a tradition which stretches right back to George Stephenson, getting a glimpse of a now-vanished way of life but one which, thanks to Railway Preservation, can still be enjoyed by both visitors, and those who volunteer their time at drivers, firemen, cleaners, guards, or in the signal box. And, unlike in the days of steam when the railways were pretty much a boys’ only club, these careers are open to anyone with the aptitude for the job. 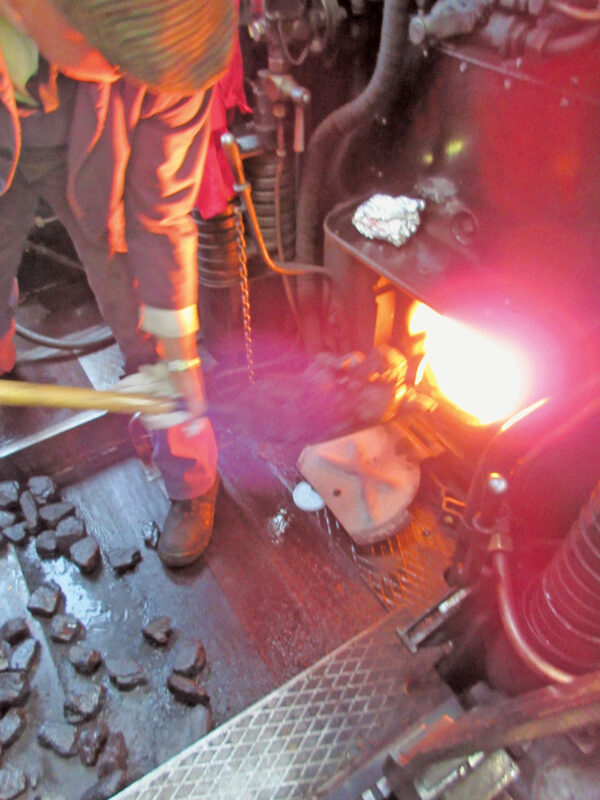 We do what we do on the footplate because we enjoy it: there is a strong sense of camaraderie, of being all Railwaymen together (even though there is the traditional ‘ribbing’ between the Locomotive Department and the Traffic Department); and we do it not just for ourselves but for the visitors to preserved lines. They get a glimpse into the life of the railway, a glimpse to their youth perhaps when all trains were steam trains, and hopefully to encourage the next generation onto the footplate or guards van to keep the skills of the steam railway alive. The excitement on the faces of young kids who can see and travel behind a ‘steam train’ is unbelievable. Steam trains make you smile. I don’t remember mainline steam and the number who do – and worked on steam – is in decline, but the skills and experiences gained nearly a lifetime ago are eagerly passed on to the new generation of steam crews. And as my friend and colleague Adrian Bailey remembers from his 40 year career on the railways, you really were part of a railway family and skills and experiences really do last a lifetime. A Day in the Life of an Engine Driver is a peek into the world of coal and steam, of oily rags and paraffin. The basics of how the locomotive works; of making a fire and checking there’s enough water; the noise and excitement of the footplate. The one thing it can’t do is communicate the warmth of the cab, or indeed that extra special smell of a steam locomotive – of burning coal; steam; hot oil and hot metal. 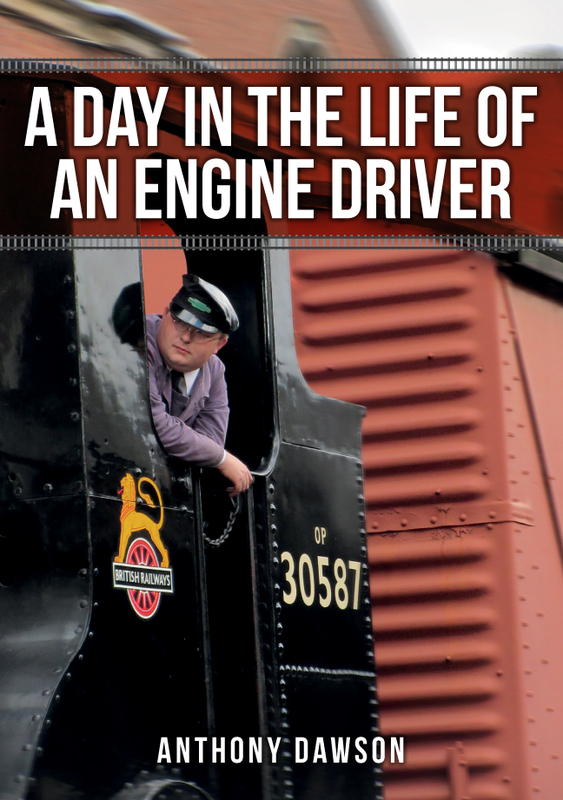 Anthony Dawson's new book A Day in the Life of an Engine Driver is available for purchase now. This entry was posted in Blog and tagged Engine Drivers, A Day in the Life of an Engine Driver, Steam Trains, Anthony Dawson, Transport, Amberley Publishing, railways on January 17, 2019 by Amberley Publishing.